Infosys was in news recently after it announced a partnership with software services provider ToneTag to offer sound-based payment solution. 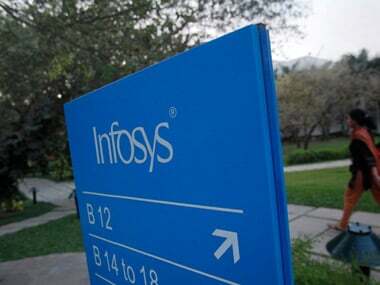 Infosys on 25 September announced the launch of a Private Cloud solution in collaboration with global software company Micro Focus SUSE that will help businesses accelerate their digital transformation journey. "This new solution will empower Infosys' clients with extreme automation backed by best-in-class professional services, which will not only provide enhanced agility but also create newer experiences," said Ravi Kumar, President and Deputy Chief Operating Officer, Infosys, in a statement. The companies have jointly invested in a Centre of Excellence to develop reference architectures, accelerators and factory-based migration solutions which will help customers in rapid adoption of Private Cloud built on SUSE OpenStack. SUSE OpenStack Cloud is an automated cloud computing platform that enables firms to innovate, rapidly deploy and manage cloud architecture. "Together, Infosys and Micro Focus SUSE can help customers attain cost efficiency through leading-edge development of open source technology while transitioning their data centres to the next generation of software-defined infrastructure," added Ronald de Jong, Micro Focus SUSE, President of Sales.